Cannabaceae the hemp family of the rose order, containing 11 genera and 270 species of aromatic herbs distributed throughout temperate parts of the Northern Hemisphere. Older authorities included the two genera, Cannabis and Humulus, in the mulberry family. These and the former hackberry family (Celtidaceae) are now included in Cannabaceae. Members of the family are erect or climbing plants with petalless flowers and dry, one-seeded fruits. 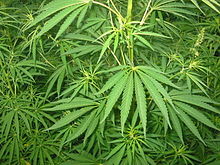 Hemp (Cannabis) and hop (Humulus) are the only economically important species.